I think that is something great!! It is a marvelous idea for authors such as myself. You can grow your following and make them aware of your releases in an easy and timely manner. Well done! Thanks for the kind comments, Alberto, Gabriella and Lefth! This is a good idea, but seems limited in a couple of ways: 1. Only those readers who buy from the Smashwords store. Those who get our ebooks from B&N and the other retail partners without ever visiting our author pages on Smashwords won't be included. 2. Only those readers who click on the Favourites button. Not all do. i've posted your information on our Smashwords Forum. It's all rather marvellous but I'm just getting a blank Alerts Subscription Management Page. I've a fair few authors listed as favourites and I've already received alerts about new releases, so I assume there should be something there. Does this new page only work on certain browsers? I use Safari on a Mac (I also tried Firefox and it was the same). Many thanks. Steph, can you log into your account at Smashwords and click the "?" to reach our support team? It's tough for me to diagnose from here. 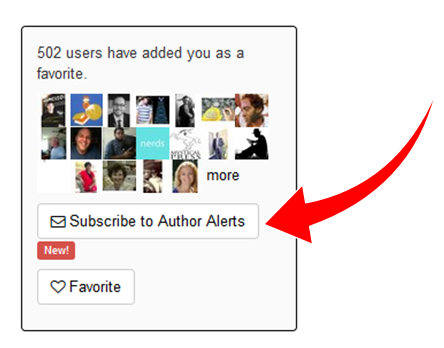 When I look at your wyrdstar publisher account, I see the account is subscribed to alerts from 21 authors. Possibly you're logged in to another account? Let us know because we're eager to identify bugs if they exist! Well done, passed the word to my readers!